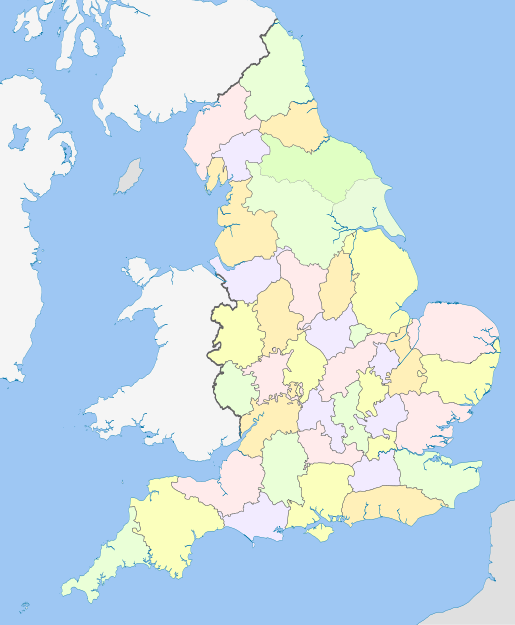 The counties of the United Kingdom are subnational divisions of the United Kingdom, used for the purposes of administrative, geographical and political demarcation. By the Middle Ages counties had become established as a unit of local government, at least in England. By the early 17th century, all of England, Wales, Scotland, and Ireland had been divided into counties. The older term shire was historically equivalent to "county". In Scotland shire was the only term used until after the Act of Union 1707. Since the early 19th century, counties have been adapted to meet new administrative and political requirements, and the word county (often with a qualifier) has been used in different senses for different purposes. In some areas of England and Wales, counties still perform the functions of modern local government. In other parts of the United Kingdom, especially within large metropolitan areas, they have been replaced with alternative unitary authorities, which are considered 'county level' authorities. Today, these by and large have replaced the historic county corporate entities granted self-governance with county government powers. Today, in addition to local government counties, every part of the United Kingdom lies within what is known as one of the historic counties; which have formed geographic and cultural units since the Middle Ages. The names of these regions are often well known, even famous (e.g. "The sheriff of Nottingham", a common county office in an historic county famed from its role in classic popular fiction) seen in older historic geographic, political, and literary (or today, in retrospective media productions) referents. The whole of England is divided into 48 ceremonial counties, which are also known as geographic counties. Many of these counties have their basis in the 39 historic counties whose origins lie in antiquity, although some were established as recently as 1974. Outside Greater London and the Isles of Scilly, England is also divided into 83 metropolitan and non-metropolitan counties. These correspond to areas used for the purposes of local government and may consist of a single district or be divided into several. As of April 2009, 27 such counties are divided into districts and have a county council. Most ceremonial counties correspond to a metropolitan or non-metropolitan county of the same name, but often with reduced boundaries. The current arrangement is the result of incremental reform; from 1974 to 1996 the metropolitan and non-metropolitan counties corresponded directly with the ceremonial counties. From 1889 to 1974 areas with county councils were known as administrative counties and ceremonial counties were defined separately. There are six counties in Northern Ireland. In order of landmass these are; Tyrone, Antrim, Down, Londonderry, Fermanagh and Armagh. A mnemonic to help remember these counties is 'FAT-LAD'. The six historic counties of Northern Ireland are no longer in use for administrative purposes. Combined with the boroughs of Belfast and Derry, the counties do serve for organisational purposes within government, and often with private businesses and sporting clubs. 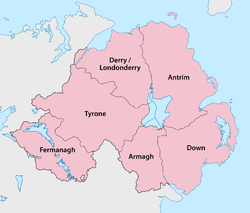 The counties of Northern Ireland are all within the historic province of Ulster, which includes an additional three other counties from the Republic of Ireland: Donegal, Cavan and Monaghan. The 1889 legislation created county councils, turned each civil county (with one exception) into a contiguous area (without separate fragments) and adjusted boundaries where civil parishes straddled county boundaries, or had fragments in more than one county. The counties of Ross and Cromarty were merged to form Ross and Cromarty. One region and various districts, created in 1975, had areas similar to those of earlier counties, and various council areas, created in 1996, are also similar. Two of the three islands areas—Orkney and Shetland—have boundaries identical to those of earlier counties. Scotland has also registration counties, which are in current use. The areas of Scotland that are appointed a Lord-Lieutenant are called lieutenancy areas. The thirteen historic counties of Wales were fixed by statute in 1535 (although counties such as Pembrokeshire date from 1138). The Administrative Counties of Wales created in 1889 were based on these. In 1974 a new system was created using vastly different entities. 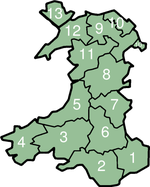 These were abolished in 1996 and since then Wales has been entirely divided into a system of unitary authorities (also known as principal areas). Eleven of the 22 unitary authorities are legally "counties", and eleven are county boroughs, although informally all are referred to as "counties". The areas of Wales that are appointed a Lord-Lieutenant are the preserved counties of Wales; which are combinations of principle areas chosen to approximate the counties constituted in 1974. Wikisource has the text of the 1911 Encyclopædia Britannica article County. ↑ "United Kingdom". Encyclopædia Britannica Online. Accessed 9 June 2014. ↑ Hampton, W. (1991). Local Government and Urban Politics. ↑ Redcliffe-Maud & Wood, B. (1974). English Local Government Reformed. ↑ Kingdom, J. (1991). Local Government and Politics in Britain. 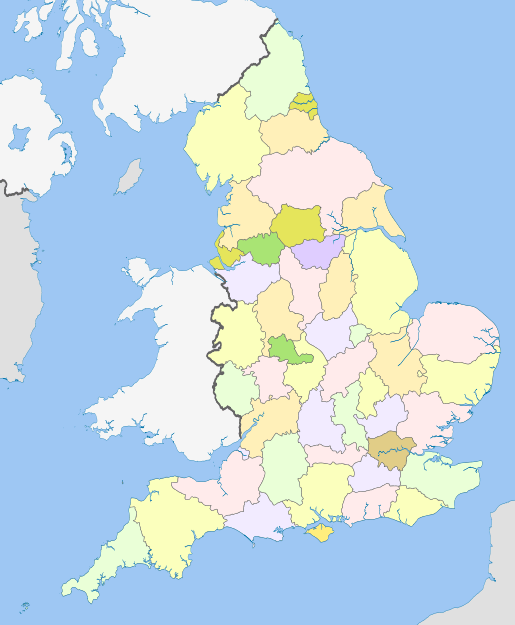 Wikimedia Commons has media related to Counties of the United Kingdom.